Indulge in sweet perfection with four juicy Royal Verano® Pears wrapped in pretty pink foil, accompanied by our new ruby cacao truffles and a bottle of Harry & David® Riesling. Boasting a subtle taste of berries and a natural hue, these creamy pink truffles are an exciting new twist on a well-loved treat. 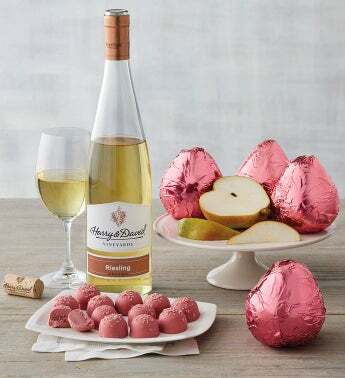 When paired together, this delicious trio makes the perfect gift for fruit fans, wine aficionados, and sweets lovers alike.